Amazon Web Services (AWS) announced that national broadcast rights holders, pay TV providers, and sports programmers used AWS, including AWS Elemental Media Services, to power live streamed experiences as an estimated 3.4 billion people watched the 2018 football tournament that concluded earlier this summer. AWS Elemental solutions were also used in the central equipment room by the tournament host broadcaster. From June 14 through July 15 as national teams competed through a series of matches for the world title, media leaders in every region of the world used AWS to achieve global scale and provide better video streaming experiences. U.S. rights holder Telemundo Deportes powered by NBC Sports’ Playmaker Media used AWS Elemental to send contribution streams from its network operations center in Moscow back to NBC Sports in Stamford, Conn., and to power HD streaming of the matches nationally on En Vivo and NBC Sports apps. The Playmaker-powered digital presentation for Telemundo delivered 1.96 billion live minutes and reached 15.5 million unique users, generating a record-setting 130 million live streams. The Mexico-Sweden Group Stage finale from Russia peaked at 1.02 million concurrent live streams — the most for any event in NBC Sports Digital History, excluding Super Bowls, and the only event other than the Super Bowl to hit the 1 million mark. According to market research firm GlobalWebIndex, the largest TV audiences for this event were in Latin America. Among AWS deployments in the region is izzi, the largest cable provider in Mexico, serving approximately 4.5 million households. Part of the Grupo Televisa media conglomerate, izzi used AWS Elemental Media Services, AWS Elemental solutions, and the Amazon CloudFront content delivery network (CDN) for streaming premium channels and in the 40 matches that izzi had the rights to transmit games over the izzi GO app. The Televisa Broadcast Network used AWS Elemental solutions in Russia to capture 4K HDR content for viewing on Televisa apps for Smart TVs through a partnership with television manufacturer Hisense. In a joint venture with Samsung and Globo.com, Globosat, one of Latin America’s biggest pay TV players and Brazil’s leading multichannel broadcaster and content provider, broadcasted all tournament matches through its free-to-air (FTA) channels and pay TV network, SporTV. Globosat used AWS Elemental to process and deliver live and video-on-demand (VOD) streamed coverage in 4K HDR using high-efficiency video coding (HEVC/H.265). Since 2013, the Uruguayan state telecommunications company National Administration of Telecommunications (Antel) has worked with AWS Elemental on several advanced video research and development projects, including workflows deployed for the Brazil World Cup 2014 and the Rio 2016 Olympic Games. 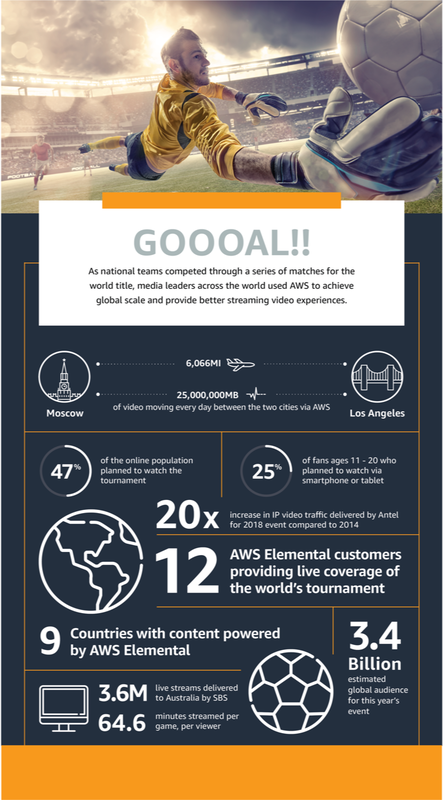 For the 2018 football tournament in Russia, Antel used AWS Elemental to process and deliver live broadcast and on-demand 4K HDR coverage of matches over its VeraTV OTT service to more than 2 million viewers on mobile devices, resulting in more than 20 times the traffic delivered in 2014 for the Olympics. In Australia, free-to-air public broadcaster SBS brought audiences its ninth consecutive tournament coverage and used AWS Elemental to stream more than 50 matches live, free, and in HD over the SBS television network and via digital platforms. 2018 FIFA World Cup Russia was a multiplatform success for SBS, reaching 9.1 million on television and 3.6 million live video streams. Elsewhere in the Asia Pacific Region, content providers including the Airtel Wynk app in India, as well as the Astro pay TV service used AWS Elemental to deliver live streamed and VOD experiences during the tournament. AWS also supported customers delivering multiscreen coverage of the events in Europe. This included Austrian public service broadcaster ORF, which used AWS Elemental in a test 4K HDR live stream of the soccer championship for OTT delivery to web clients, iOS devices, and Smart TV platforms. The ORF workflow was supported by system integrator Logic Media in cooperation with ORF and the Institut für Rundfunktechnik IRT.